Ebola Researchers Have A Radical Idea: Rush A Vaccine Into The Field : Goats and Soda Traditional methods for containing the Ebola outbreak aren't working fast enough. So some scientists want to bypass the typical trial phases and bring new vaccines directly to people at risk. 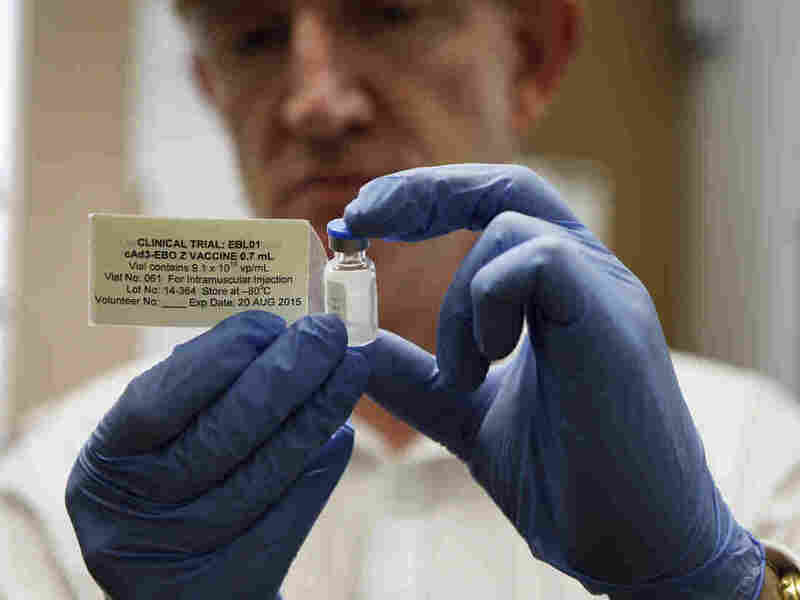 Adrian Hill, director of the Jenner Institute and chief investigator of the trials with an Ebola vaccine his organization developed, holds a vial of the vaccine. Today, the World Health Organization concludes a two-day meeting to discuss a radical idea: bringing a vaccine into the field without having tested its effectiveness. Traditional means of containing Ebola — such as isolating people who are infected with the disease and tracing the people they've come into contact with — aren't working fast enough to get ahead of the epidemic. So the question is: Will giving an experimental vaccine to willing volunteers help contain the disease or put people at greater risk? Dr. Adrian Hill, director of the Jenner Institute at Oxford, says the urgency of the Ebola situation has led to throwing traditional timelines "out the window." The problem is that all of our norms change when thousands of new cases of Ebola are happening all the time and 50 to 60 percent of these people are dying. That changes the rules about what we have to lose when we try something new. He's part of a team of doctors at Oxford University, the National Institutes of Health and the pharmaceutical company GlaxoSmithKline who are rushing to create one of several new Ebola vaccines. Hill says their vaccine could be ready to give to health care workers as early as late November. That would be an extremely fast pace compared with the typical timeline for developing a new vaccine. Moncef Slaoui, who's in charge of vaccines for GlaxoSmithKline, says his company has been working on a malaria vaccine for 31 years. While that may be an extreme example, five to 10 years is considered average. A typical vaccine trial starts small. Scientists inject about 20 healthy volunteers and closely monitor their health for six months to a year. They test volunteers' blood every other week and check for signs like fever or swelling, which could indicate the vaccine is unsafe. Eventually, the scientists add more volunteers to the study. And they test higher doses. Ebola researchers at the NIH, Oxford and GlaxoSmithKline are compressing those steps to meet the November deadline. They plan to look at volunteers' blood for antibodies they know are protective against Ebola. But before vaccinated people come into contact with the disease, developers can't know for sure that the vaccine works. For that kind of certainty, they'd need to set up a trial with thousands of people in places where Ebola outbreaks are occurring. One group would get the real vaccine; the others would get a placebo. By comparing the two groups, developers could begin to understand whether their vaccine is effective. But Ebola vaccine researchers are debating whether to bypass this phase of testing because so many lives are at stake. Nancy Kass, a public health ethicist at Johns Hopkins University, says that the best way to study a new vaccine is to test it against a placebo. But the situation in West Africa complicates that decision. "The problem is that all of our norms change when thousands of new cases of Ebola are happening all the time and 50 to 60 percent of these people are dying. That changes the rules about what we have to lose when we try something new," she says. Some scientists think moving forward without a control group of people who don't get the vaccine isn't worth the risk — notably Anthony Fauci, director of the National Institute of Allergy and Infection Diseases at NIH. "If you did it in the way where you never could tell whether it worked well, worked a little, didn't work at all, or actually made people worse ... you could actually propagate a disaster," he says. Fauci has experience with vaccines that appeared to be safe during the initial phases of testing but turned out to be ineffective and even dangerous. Most recently, an HIV/AIDS vaccine was deemed safe but in later tests "increased the risk of HIV infection in the people who were vaccinated," he says. WHO says it supports the use of unproven interventions to treat Ebola. And GlaxoSmithKline isn't waiting for testing to be completed. It's producing 10,000 doses of the vaccine. That's much more than would be needed for a trial.